What are my options to purchase new centers for my stock wheels? For some reason I love the wheels but just can't stand the RAM heads. Tony had some nice ones, I do not know if he still makes them. I had chatted with his wife about these and she didn't have any in stock but could have some made. I thought I would see if there were other options out there (especially with pictures) I did purchase my viper front grill logo from her and its awesome so might just place my order and wait. "The Truck" as my whole family calls it!!! #1357 of 3057 2004 Dodge Ram SRT-10 SOLD! 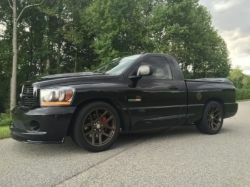 #0851 2006 Dodge Ram SRT-10 RC SOLD!